This quart sprouting jar is everything you need to get started. Includes a strainer lid, 4 ounces of organic alfalfa seeds and detailed instructions on the label. Easy jar method to grow sprouts with the size to grow in quantity. 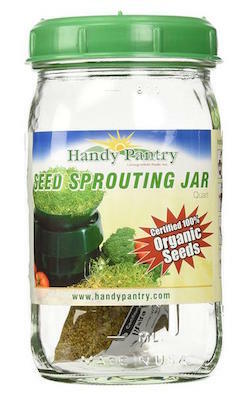 Soak the seeds in your Seed Sprouting Jar using the green screen top according to instructions. Rinse & drain your sprouts thoroughly twice a day with cool fresh water. Place jar in a dark place. Prop your seed sprouting jar at an ancle screen down to ensure proper ventilation for the sprouts. As sprouts grow proceed with the rinse cycle, twice daily, until harvest time; about 3-5 days (sprouts will be about 3" in length). Place srouts in indirect light for 2-4 hours to develop green coloration. Kit comes with high germination rate organic alfalfa sprouting seeds.